Massachusetts Oyster Project: Listing of Oyster Restoration Programs Around the U.S. Massachusetts has some catching up to do! Listing of Oyster Restoration Programs Around the U.S. Massachusetts has some catching up to do! Seacoast On-line Re-Published this list of oyster restoration programs from Wayne Parry's work at the Associated Press. The good news is that the number and amount is growing. It is up significantly from when we first created the first comprehensive map to oyster restoration programs in 2014. The disappointing news is how little is going on here in the Bay State. But at least now there is something happening here. ALABAMA: 1,100 acres of oyster reefs created from 2009-14; additional work ongoing. CALIFORNIA: Restoration programs in San Francisco and Richardson bays, among others. CONNECTICUT: State borrowed $5.3 million for oyster restoration since 1987; enhanced 3,000 acres of existing beds. DELAWARE: From 2005-09, a joint New Jersey-Delaware program deposited 2.4 million bushels of shells onto existing reefs in Delaware Bay. FLORIDA: Multimillion-dollar restoration project in Pensacola Bay using limestone, recycled concrete and marsh plantings. State has restored coastal habitat including oyster reefs since 1994 through a grant program, has built 11 reefs throughout Florida panhandle and recycles shells from 28 restaurants; 900 oyster reefs established along 2 miles of shoreline in Santa Rosa County over past 20 years; MacDill Air Force Base installed half-mile oyster reef; volunteer groups restored 42 oyster sites since 2005. LOUISIANA: Six 200-acre oyster plots built from 2011-2014; oyster reefs installed as shoreline protection in Cameron and Vermillion parishes; Lake Athanasio, among other spots. MARYLAND: Some of nation's largest and most numerous oyster restoration programs underway in Chesapeake Bay. MASSACHUSETTS: Towns of Barnstable and Wellfleet launched their own oyster restoration projects; nonprofit groups seeking to restore oysters in Boston Harbor. MISSISSIPPI: State and volunteer groups doing numerous restoration projects, including at Deer Island, Mississippi Sound and Back Bay. NEW HAMPSHIRE: Numerous programs, including one by University of New Hampshire involving restaurants and volunteers that has added more than 18 acres of oyster reefs and more than 3 million oysters to the ecosystem in the past six years. 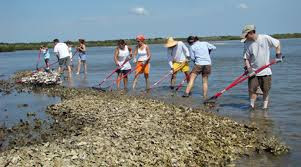 NEW YORK: Restoration programs, including the "Billion Oyster Project" in New York Harbor; Hudson River; Great South Bay, Peconic Bay and Bronx River. NEW JERSEY: 2.2 million bushels of shells planted on 1,350 acres of existing oyster beds from 2003-14; projects ongoing in Barnegat Bay; Great Egg Harbor; Mullica and Navesink rivers. NORTH CAROLINA: State established 12 oyster sanctuaries totaling 228 acres; has run oyster shell recycling program since 2004. OREGON: Restoration projects in Coos and Netarts bays. RHODE ISLAND: Numerous restoration projects in Narragansett Bay, including one in which volunteers grow bags of oysters attached to their docks until they grow enough to be transplanted to reefs in the bay, in coastal salt ponds and on Block Island. SOUTH CAROLINA: Planted 150,000 bushels of oyster shells from 2002-2006 at 34 sites covering 9 acres; since 2001, more than 400 reefs built at 44 sites from Hilton Head to Murrells Inlet. TEXAS: State has been restoring oysters since 2007 in Galveston Bay and Sabine Lake. VIRGINIA: Restoration projects at Tangier Island; Rappahannock, Great Wicomico and Lynnhaven rivers; numerous local government and volunteer projects. WASHINGTON: Restoration projects in Puget Sound and Port Susan and Woodward bays; local restoration project in Olympia.